Unasylva is published quarterly in English, French and Spanish editions. Subscription price: one year US$26.00 payable to the Distribution and Sales Group. FAO, Viale delle Terme di Caracalla, 00100 Rome. Italy. Or to any of the FAO sales agents listed on the inside back cover. Material not copyrighted may be reprinted with credit to Unasylva FAO. Articles express the views of their authors. not necessarily those of FAO. Designations employed and presentation of material do not imply expression of any opinion on the pan of FAO concerning the legal status of any country, territory, city or area or of its authorities, or concerning the delimitation of its frontiers or boundaries. 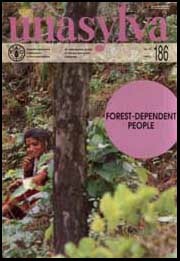 The FAO publications reviewed in Unasylva may be ordered from any of the FAO sales agents listed on the inside back cover. The Distribution and Sales Group, FAO, Viale delle Terme di Caracalla. 00100 Rome. Italy, will process orders from countries where there are no sales agents. Credits. G. Bizzarri (cover photo): FAO (page 3,4,5,6,7) J.C.L. Dubois (10): A. Anderson (12,13) C.R. Clement (14); J. Utsi (16,18): P.-O. Utsi (20); J. Anderson (22-23,26); S. Anderson (27); K. Andersson (28,30,31): K. Moran (41,43,44,45). R. Morandini (47) A. Shaw (53) J. Butcher (54 upper): Ontario Ministry of Natural Resources (54 lower); Provincial Archives of Manitoba (56) FAO (60).